The Virginia Commonwealth University is a small school located in beautiful Richmond, Virginia. The school was founded in 1838, and it is still one of the top medical programs in the country. Even still, the real highlight at this classic institution of higher learning is the VCU men’s basketball team. The VCU Rams are one of the most formidable teams in the country and their past dominance has continued thus far this season. The Rams have an impressive record of 12-3, and they have a tenacious defense that limits their opponent’s options on offense. The Rams average of 12.4 steals a game is tops in the nation. They are also fourth in the nation in turnover margin at plus six a game. If the Rams are to make the tournament of 64 in March, Head Coach Shaka Smart will have to keep up the defensive intensity that his players have displayed all season long. The 2014 VCU Rams lineup is not very experienced but what they lack in age, they make up for in sheer tenacity. The starting five are some of the best players in the country, and they are backed by many youth coming off the bench. Briante Weber is a junior form Chesapeake, Va. The 6’3″ Junior is the starting point guard on the Rams squad and 6’2″ Senior Rob Brandenberg completes the starting backcourt. Brandenberg is from Gahanna, Ohio and he starts at shooting guard. The Rams starting Small forward is 6’5″ junior Treveon Graham from Washington D.C. The 6’8″ Junior Jarred Guest from Columbia SC is the starting power forward, and the starting center is 6’9″ Senior Juvante Reddic from Winston-Salem, NC. 6’8″ redshirt senior, Terrance Shannon from Forsyth, GA also gets the nod at center and power forward from time to time and he splits minutes with Reddic and Guest. Several underclassmen on the Rams squad provide a vital spark off the bench. Jairus Lyles is a 6’2″ freshman guard from Washington D.C. He splits time with fellow freshman guard, 6’1″ JeQuan Lewis of Dickson TN. The 6’3″ guard Doug Brooks from Lake Wales, FL is another freshman in the backcourt. Torey Burston is a 5’8″ red freshman is another guard on the Rams squad. The young man is a local product of Richmond’s Trinity Episcopal high school. Jordan Burgess of Midlothian VA is yet another freshman who plays the small forward position. Emerson Burk of Chesapeake VA is a 6’9″ forward and he too is a true freshman. Mo Alie-Cox is a 6’5″ freshman from Lorton VA, though he plays the power forward position. Antravious Simmons of Miami, Florida is yet another freshman at the forward position. Melvin Johnson is a shooting guard from the Bronx and he is the team’s sole sophomore. With so much youth on the sidelines, it is easy to understand why so many people are getting excited about Rams’ future. Even still, the seniors and juniors on the team give them a chance to win right now, and win, they have. 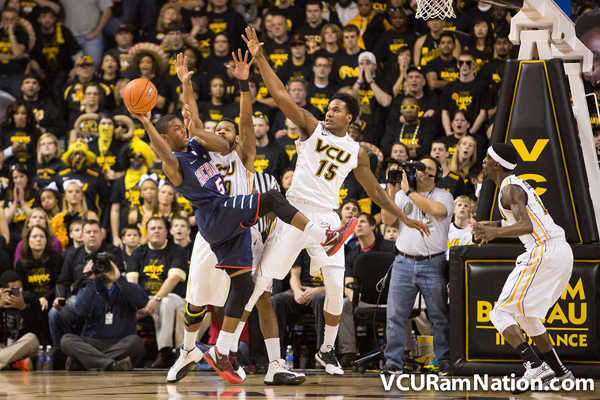 Their last contest against Stony Brook College took place in Richmond and the Rams won handily 81-63. Junior forward, Treveon Graham led the Rams with 20 points and 7 rebounds to go along with his 3 assists. The victory on January 3 was only one of several blowout wins for the Rams this season. Their largest margin of victory came against the Illinois State Redbirds on the season opener. The Rams destroyed the Redbirds (6-58 in their own home stadium). The Rams then went on to win their home opener in a nail biter against top 25 contender Virginia 59-56. The Winthrop Eagles were the next test for the Rams, and they dismantled the birds by 21 points on their own home floor 92-21. The Florida state Seminole handed the Rams their first loss of the season 85-67. The Rams bounced back with a 73-67 win over Long Beach State the next day but lost a heartbreaker to Georgetown two days later. The Rams then managed to roll off 4 straight wins, knocking off the North Eastern Huskies 79-66, followed by the Belmont Bruins 81-68, the Eastern Kentucky colonels 71-68 in overtime and Old dominion a 69-48 laugher. Perhaps the big win over the Monarchs made the Rams overconfident because they lost the following game to Northern Iowa, 77-68. The Rams have subsequently gone on another 4 game winning streak, defeating the Wofford terriers 72-57, the Virginia Tech Hokies 82-52, the Boston College Eagles 69-50 and most recently Stony Brook. The next test will be against perennial NCAA tournament regular George Mason. The GMU Patriots are having a disappointing season at 7-6, but they are still one of the toughest challenges the Rams have had this season. This game will mark the Ram’s first game within the conference this season and they will be looking to start with a W.
In order for the Rams to make the tournament of 64, they will probably have to win the Atlantic 10 (A 10) conference. As of now, #23 ranked Massachusetts is in first place in the conference with a record of 11-1. Saint Louis and George Washington are right behind UMass. Each school has a record of 12-2, putting them a half-game ahead of the Rams at 12-3. The Rams will face George Washington on February 12, followed by Saint Louis 3 days later and UMass 6 days after that. If the Rams can win all 3 games, they should be in the driver’s seat to win their conference and earn a berth into the 2014 March Madness tournament. The best players for the Rams this season have been Treveon Graham and Juvonte Reddic. The young men lead the Rams in scoring, Graham with 15.7 ppg and Reddic with 11.7. They also lead the team in rebounds, Reddic with 7.3 per contest and Graham with 6.5. Graham is also second on the team in assists with 2 per game. This strong inside presence is what makes the Rams so formidable. Head Coach Shaka Smart is one of the best young coaches in the country. He is a Billy Donovan disciple. He may not have the top talent in the country but Smart knows how to maximize the tools he does have. His recruitment of a phenomenal freshman class has many people in the Richmond area very excited about VCU’s future. While the Rams have fallen from a #14 overall ranking to being unranked, they still have impressive victories over in state rivals Virginia and Virginia Tech. The Rams will go only as far as Shaka Smart can take them but as of right now, the future looks as bright as ever. People from all across the commonwealth state are bonfire Rams fans, cheering for both the men’s and women’s basketball teams. Time will tell if the Rams men’s team can finish strong and win their conference but with a great coach and a foundation of very good, young players in place, the VCU Rams could be a top contender for quite some time. They could even make a splash this year if they get into the tournament of 64. This team makes residing on or near the school’s campus a vibrant and exciting scene as fans and fanatics alike fill the VCU auditorium for each home game. Anyone living near the campus is sure to marvel at the wild fans and the lengths they will go to show their team spirit.